The meniscus is a rubbery c-shaped wedge structure in the knee that provides cushion and stability. There are two menisci in the knee, one on the inside of the knee (medial meniscus) and one on the outside of the knee (lateral meniscus). The menisci are most commonly torn in athletic activities but they are also more prone to tearing with increased age. 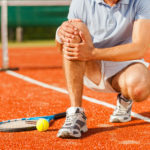 These injuries usually occur with a forceful twisting of the knee while bearing weight. Symptoms of a meniscus tear include: popping or catching sensations in the knee, joint swelling, sharp pain along the joint, or difficulty fully straightening the knee. First line treatment is often conservative and includes rest, ice, activity modification, therapy, and medication. Injections can also be considered. If symptoms persist and there are any issues with knee mobility, or the symptoms fail to improve with conservative treatment, diagnostic imaging (MRI) or surgical treatment may be recommended.